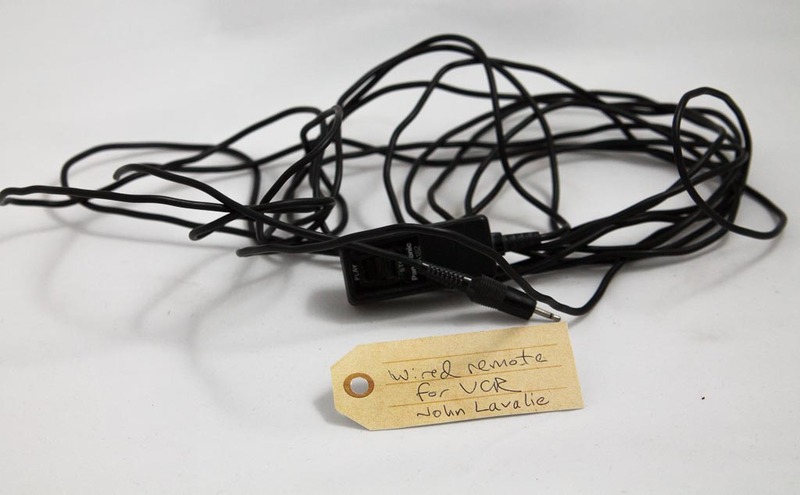 Wired remote for VCR | That Belongs in a Museum! My object is a wired remote for a VHS. This particular model goes with the Panasonic that mom bought for us for Christmas in 1980. […] It had to be pretty long, and you used it to cut commercials. […] I think this VCR was one of the last sort of mechanical VCRs [before] you started getting wireless remotes. Before video stores took off (you could put video stores in a museum)… Fast forward to about 2009 when I joined the Museum of Classic Chicago Television, our job is collecting old Chicago TV… old commercials. Unfortunately, a lot of the tapes that we’ve acquired have no commercials in them because of this object. So I don’t know that I’d want to put this in the Museum of Classic Chicago Television because it’s already done the damage. Maybe some sort of time traveling museum, so we can go back and tell these people that all these tapes they made can be bought on blue ray, so these tapes are just useless.